An astounding $4 billion will be spent on the midterm election campaign this year, says the Center for Responsive Politics (CRP), a campaign watchdog group. Yet from the looks of things, that obscene amount still isn’t enough to satisfy the needs of Republicans and Democrats slugging it out for control of Congress. National Republicans, feeling a spending pinch, recently pulled their advertising from the race for an open Senate seat in Michigan after polls showed that Democratic Rep. Gary Peters was almost certain to beat former secretary of state Terri Lynn Land, the GOP nominee. With some of those savings, Republicans then pumped $400,000 more into the race for another open seat in Iowa, where GOP state senator Joni Ernst holds a slight lead over Democratic Rep. Bruce Braley. In Kentucky, meanwhile, Senate Minority Leader Mitch McConnell has dipped into his personal treasure chest to lend his reelection campaign $1.8 million. McConnell, 72, who aspires to be the next Senate Majority leader if Republicans win control, holds a narrow lead over the 35-year-old Democratic challenger Alison Lundergan Grimes. But he’s not taking any chances after the Democratic Senatorial Campaign Committee and the Senate Majority PAC said last week they would spend an additional $1.5 million on Grimes’ campaign. 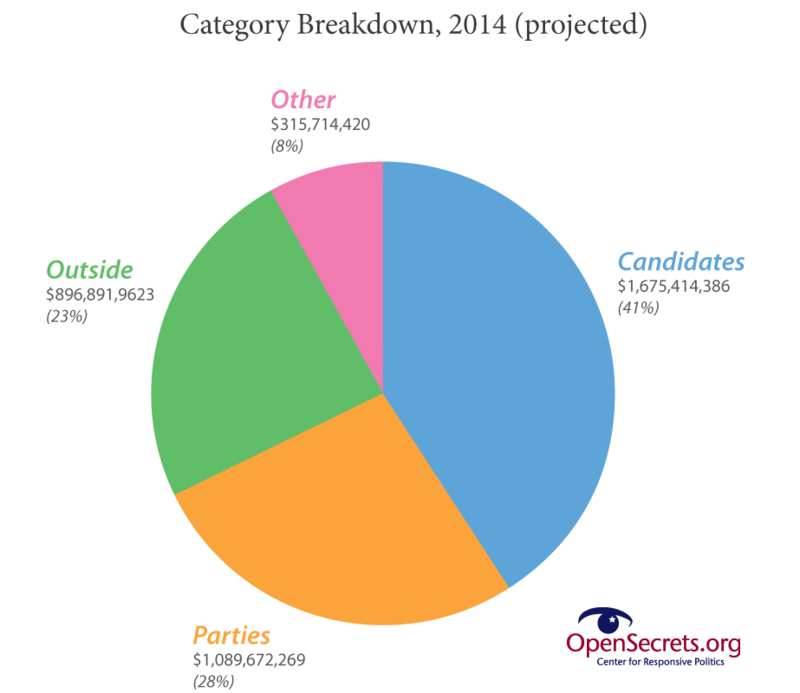 A new era of virtually unlimited campaign contributions, Super PACs and secretive independent campaign fundraising and expenditures has opened the door to an outrageous amount of campaign spending this year. Republicans are pulling out all the stops to try to pick up at least six seats to win Senate control and to expand their existing majority in the House. Democrats are desperately trying to match them to somehow hang onto control of the Senate. 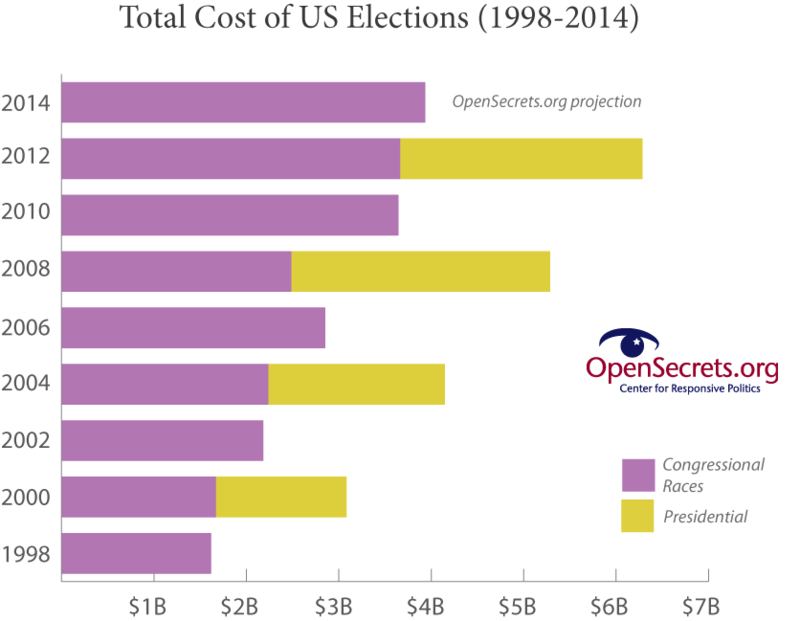 The $4 billion spending projection, if it proves accurate, would make this year’s election by far the most expensive midterm campaign in history. “The candidates and parties alone will combine to spend about $2.7 billion, while outside groups will likely spend close to $900 million on their own — a figure that veers close to the $1.3 billion spent by outside groups in 2012, when the hyper-expensive presidential race was fueling the fire,” according to the CRP analysis. When all is tallied, Republicans almost certainly will outspend Democrats, says the analysis. Republican and conservative-leaning candidates, party committees and outside groups will spent at least $1.9 billion, compared to at least $1.76 billion by Democrats and liberal-leaning groups. Just as in the 2012 presidential campaign cycle, “the explosion in outside money is a dominant theme of this election’s spending story,” CRP notes. So far, at least $663.3 million has been spent by outside groups like Super PACs and tax-exempt 527s, but CRP’s projections based on the pattern in the 2012 cycle indicate that at least another $233.5 million remains to be spent in the 12 days before Nov. 4. Democrats and liberals will hold a slight advantage in House and Senate party campaign committee spending and in the amount spent overall by outside groups. The lead in outside spending, however, does not include money that groups spent on certain kinds of ads that didn’t have to be reported to the Federal Election Committee if they aired more than two months before the election, according to the analysis. This move potentially could bring Republicans closer to the 12-seat gain needed to match the party’s post-World War II record of holding 246 House seats, according to The Journal. “The Republican entrance into additional districts – in Iowa, Nevada and elsewhere – adds to evidence that voters are making a late turn away from the Democratic Party,” The Journal reported, based on a new Wall Street Journal/NBC News/Annenberg survey on Sunday. That poll showed Republicans with a four-point lead over Democrats among registered voters on the question of which party should control Congress – 46 percent to 42 percent. Among likely voters, Republicans held an 11-point advantage.